I never had much time for these Swedes in my early Metal years, seeing them as yet another Swedish Melodeath band that ultimately fit in the same box as Soilwork and In Flames. Of course, once I’d got over the initial euphoria that comes from making the leap in tastes from Iron Maiden to Darkthrone and started to explore everything inbetween, I discovered that Soilwork, In Flames and the like were actually brilliant, and Hypocrisy is no different, although for quite different reasons. Today’s choice, The Final Chapter, was their fifth full-length and was intended to be their last so the members could concentrate on other projects, yet due to fan pressure the band kept going, and listening to this it’s not hard to hear why – if it had to be their last album, it would have been a kickass goodbye. The moment where it all clicked for me was on the first track of this album, Inseminated Adoption, which popped up on a random playlist and is a cascading torrent of downtuned catchiness that slams into your skull like a brick. It keeps getting bouncier and more melodic, building up wonderfully to the moment when Tägtgren’s snarled vocals rip in like the offspring of Carcass’ Jeff Walker and some uncanny extraterrestrial being. For a three-man-band Hypocrisy certainly pack a heavy punch, Tägtgren’s excellent production giving the music an unearthly, hypnotic sheen and his guitar a thick, grooving crunch, and the songwriting is, of course, terrific, ripping along and carrying you with it whilst ensuring maximum Metal value, great variety in riffs and frequent solos. What’s not to like? By the time second track A Coming Race rolls in like Amon Amarth on crack, melodic guitars and atmospheric backing keyboards ramped up to the full and grandiose structure ensuring horns held high, you’ll be hooked, and the album doesn’t drop the ball from then on, but gets better and better. I can’t find a weak moment, really, although it’s interesting how familiar this will all seem if you’ve heard much Melodic Death from the past few years. What the clones lack, however, is the songcraft and alien-obsessed atmospherics, both of which conspire to keep you engrossed. As good as, say, the Thrashy grind of Dominion is, you’re faced with something even better right away with the keyboard-dominated and prog-tinged Inquire Within, a slow, Doomy, crawling behemoth of a track that introduces surprisingly effective gloom-filled clean vocals and uses its just-under-six-minutes length to steamroller the listener completely. Even random mid-album tracks like Last Vanguard prove to be anything but filler as they punish you with the intensity that fans of the band expect. There’s more epic clean vocals on Request Denied, the near-perfect Death Metal attack of Through The Window Of Time (seriously excellent guitarwork, take that, Nevermore!) will lay you to waste, and Shamateur is more or less Black Metal in execution for a good chunk of its running time. Again, the variety is outstanding – I haven’t even mentioned the cover of Razor’s Evil Invaders, which is awesome, or the depressing, apocalyptic title track, which manages to make all the wonderfully grandiose moments up until then look like nothing. Zero. 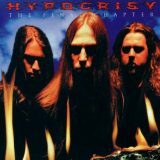 So if you’re looking for a band to deliver old-school Melodeath crunchy atmospheric metal thrills, and haven’t fully acquainted yourself with Hypocrisy’s back catalogue (I’ve not heard half of it) then be sure to check this out.